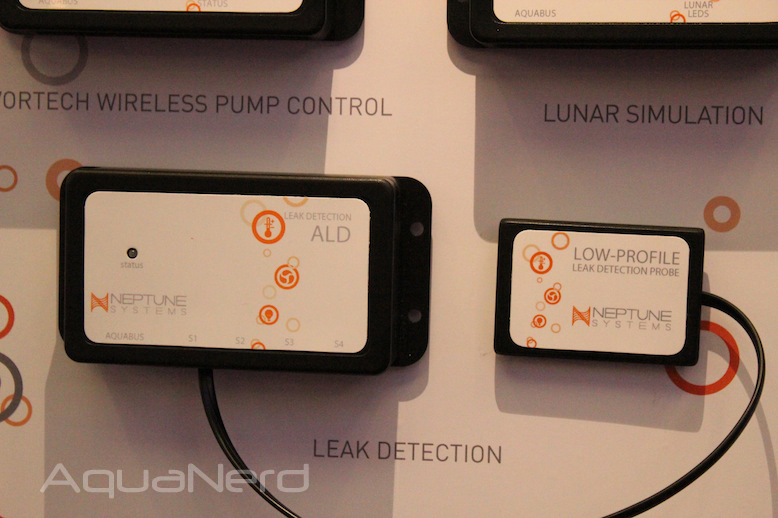 The AquaController is arguably one of the most robust and popular lines of aquarium controllers on the market today, and Neptune Systems is constantly finding ways to add to their functionality through the implementation of new modules. Their latest new toy, which was shown off at MACNA this past weekend, is a leak detection module that uses a low profile probe that alerts your controller when water is collecting in your stand or other leak prone areas. The probe utilizes numerous metal pins on its underside that conduct an electrical current when it comes in contact with water. When a leak is detected, the module sends a message to the controller, which can turn off pumps and other devices to prevent the leak from growing and keep some electrical equipment from getting exposed to the ever destructive saltwater. New hardware aside, you might notice while reading this article a new look to the Neptune Systems products. We’re not ignoring it, believe me. We’ve got more information coming in a future post regarding this beautifully done re-branding effort, so stay tuned.